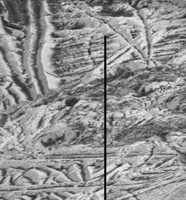 This mosaic of images includes the most detailed view of the surface of Jupiter's moon Europa obtained by NASA's Galileo mission. The topmost footprint is the highest resolution image taken by Galileo at Europa. It was obtained at an original image scale of 19 feet (6 meters) per pixel. The other seven images in this observation were obtained at a resolution of 38 feet (12 meters) per pixel, thus the mosaic, including the top image, has been projected at the higher image scale. The top image is also provided at its original resolution, as a separate image file. It includes a vertical black line that resulted from missing data that was not transmitted by Galileo. 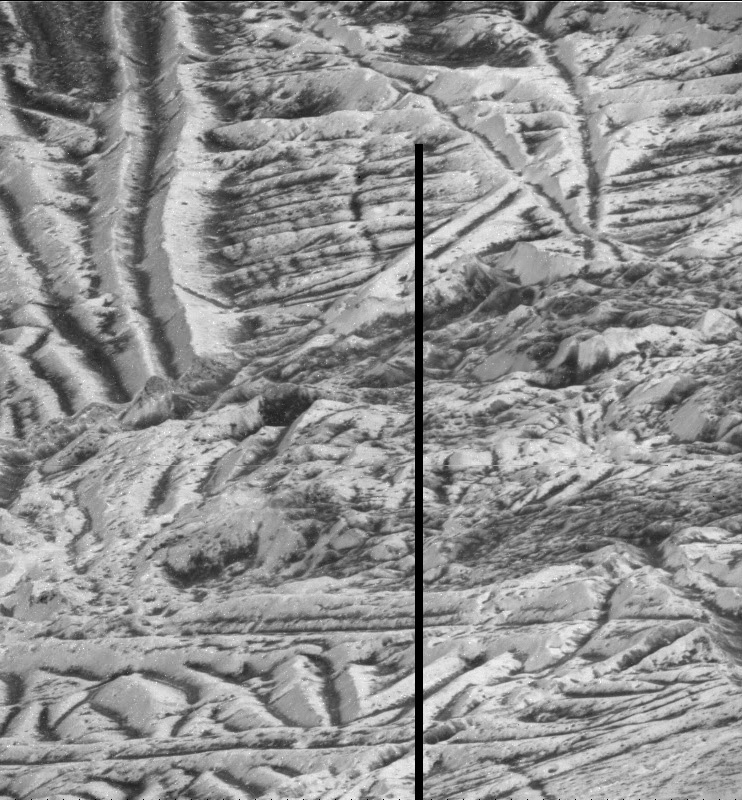 This is the highest resolution view of Europa available until a future mission visits the icy moon. The right side of the image was previously published as PIA01180. Although this data has been publicly available in NASA's Planetary Data System archive for many years, NASA scientists have not previously combined these images into a mosaic for public release. This observation was taken with the sun relatively high in the sky, so most of the brightness variations visible here are due to color differences in the surface material rather than shadows. Bright ridge tops are paired with darker valleys, perhaps due to a process in which small temperature variations allow bright frost to accumulate in slightly colder, higher-elevation locations. The Galileo mission was managed by NASA's Jet Propulsion Laboratory in Pasadena, California, for the agency's Science Mission Directorate in Washington. JPL is a division of Caltech, also in Pasadena. Additional information about Galileo and its discoveries is available on the Galileo mission home page at http://solarsystem.nasa.gov/galileo/. More information about Europa is available at http://solarsystem.nasa.gov/europa.